The Public Policy Institute of California (PPIC) is a nonprofit think tank that is conducting research aimed to improve public policy in California. 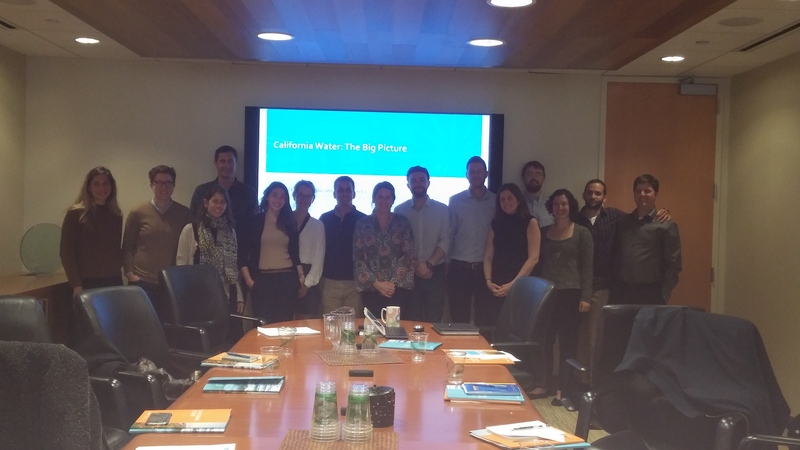 Our meeting included an introduction with the PPIC Water Policy Center, and a fascinating discussion on the roles and activity of the Institute, as well as California’s recent drought and implications in terms of policy-making. During the fascinating discussion, an evident dualism of the PPIC’s role emerged. On one hand, they are devoted to making California a better place and influencing the relevant stakeholders. Therefore, they maintain a strong connection with the non-research community and aspire to create products that can be comprehended by a variety of individuals. In other words, their results are aimed to be “research that matters”, with hopes that their recommendations have policy implications and are accepted. On the other hand, the institute values its integrity above all. The quality of the research is of utmost importance, and they do not hesitate to make a complex argument, if that should be necessary. With these two pillars of identity, the institute is striving to remain objective but nonetheless involved, sensitive to what’s happening outside of the institute, but undeviating from the truth. As someone who has spent the past year and a half in the National Economic Council (NEC) in the Prime Minister’s Office, and recently in the Milken Innovation Center as well, I can identify with the some of the challenges that the institute might be facing. For example, sometimes economists from the NEC come up with a solution that is favorable professionally, but they know that it will be politically difficult to execute it. Then, the question arises whether to make adjustment in order to conform it to the current political climax. Despite the resemblance of the challenges of the two bodies, I acknowledge the vast differences that exist between them as well. The biggest discrepancy between the two is, of course, that the NEC is a government body. Thus, the professional opinion that it expresses is often the official approach of the government. The role it plays in decision-making is not of an outside consultant, but as a full participant in the process. Nevertheless, the NEC and the PPIC share a common trait, and that is the privilege to allocate time to thinking. The NEC, as the PPIC, strives to form its policy decisions in a knowledgeable way, through data analyzing, brainstorming and coming up with creative solutions. Because of this, the optimal solutions the NEC comes up with are sometimes complex or unconventional. We sometimes face the dilemma of simplifying our arguments in order to make them easier to execute, or insisting on difficult arguments that are more loyal to the truth. I imagine the same questions cross the PPIC’s staff minds when a report is being made ready to publish. Meeting with the PPIC as a Milken Fellow, but also as a NEC economist, made me realize how much researchers around the world have in common, especially those involved with policy. In two separate continents on opposite sides of the planet, we’re dealing with similar challenges. I’m thankful for the opportunity I have been given to acknowledge this, and hope that in the future we’d be able to come up together with creative ways of coping with the dilemma of theoretical integrity versus relevance.